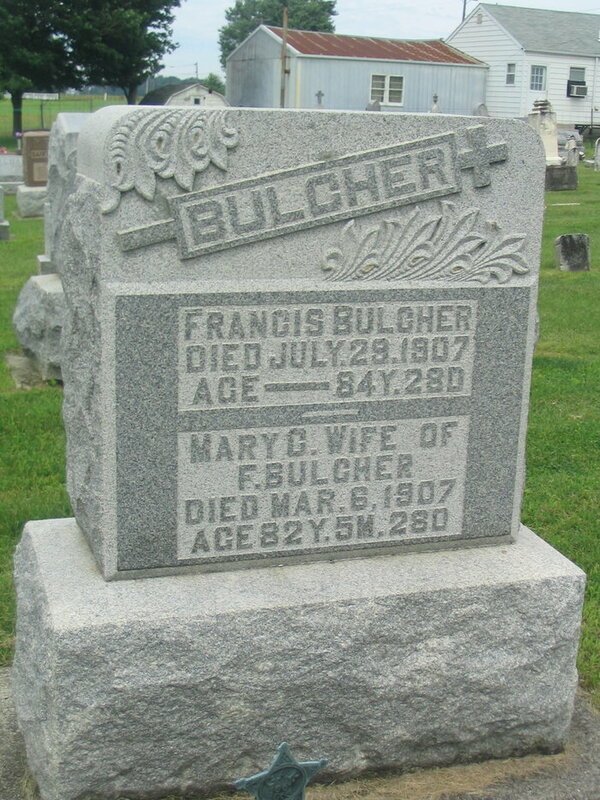 This is the headstone of my husband's 4x great-grandparents, Francois Pierre Bulcher and Mary Celestine (Voisinet) Bulcher. They were born and married in the small French village of Evette, which is currently situated in the Territoire de Belfort and located not far from France's eastern borders with both Switerland and Germany. 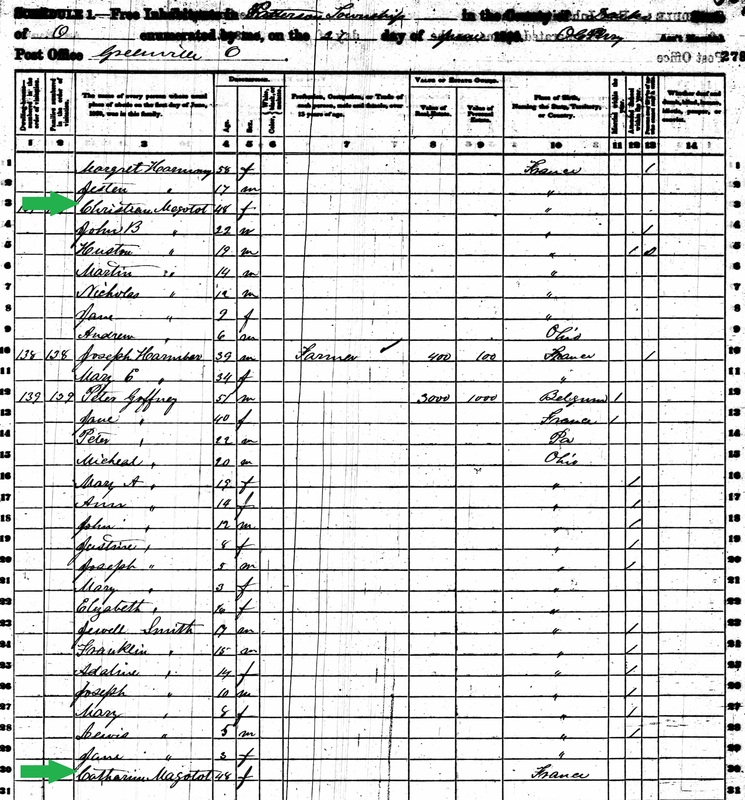 They came to America through New York as a young married couple in 1847 with a baby daughter named Marie Rose (Mary Rosa), who is my husband's 3x great-grandmother. They entered the country under the surname of "Burtechert." Their journey from France to Western Ohio is chronicled in a biographical sketch of one of their sons, Joseph John Bulcher, which was published in A Biographical History of Darke County, Ohio. "It was a long and tedious voyage from Havre to New York, and by canal they proceeded to Buffalo, by lake to Toledo, and by canal to Berlin*, Ohio, where they arrived in the woods. By ox team they came to Wayne township, Darke county, and the father (Francois) pruchased forty acres of land just over the line in Shelby county, for which he paid three dollars per acre." *This town of Berlin is now known as Ft. Loramie. According to U.S. census data, the family lived on this land for about twelve years before moving to Patterson Township in Darke County. Francis and Mary Celestine lived here until they both died in 1907. They were married for sixty years and had twelve children together. Mary Rosa was born in 1846 in the French town of Belfort, which is located in the Franche-Comté region of northeast France. 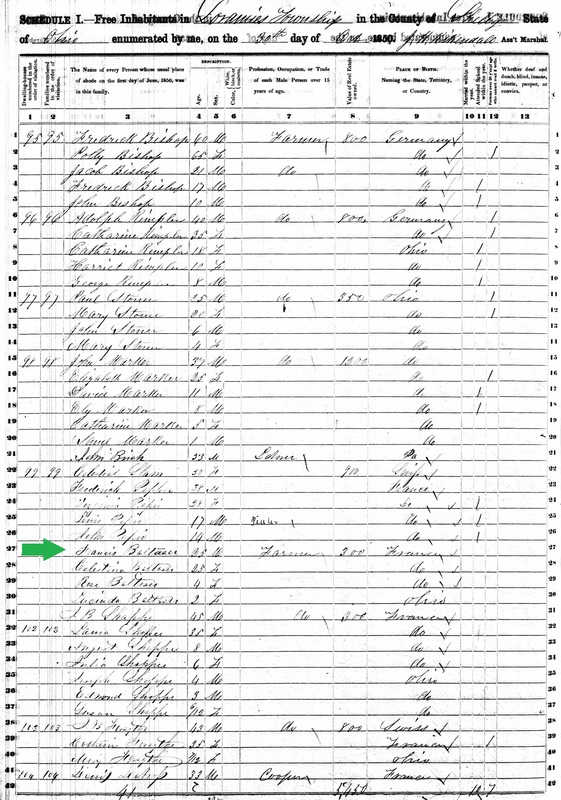 She came to America as an infant in 1847 with her parents, Francois Pierre Burtechert (or Burtecher) and Marie Celestine Voisinet. 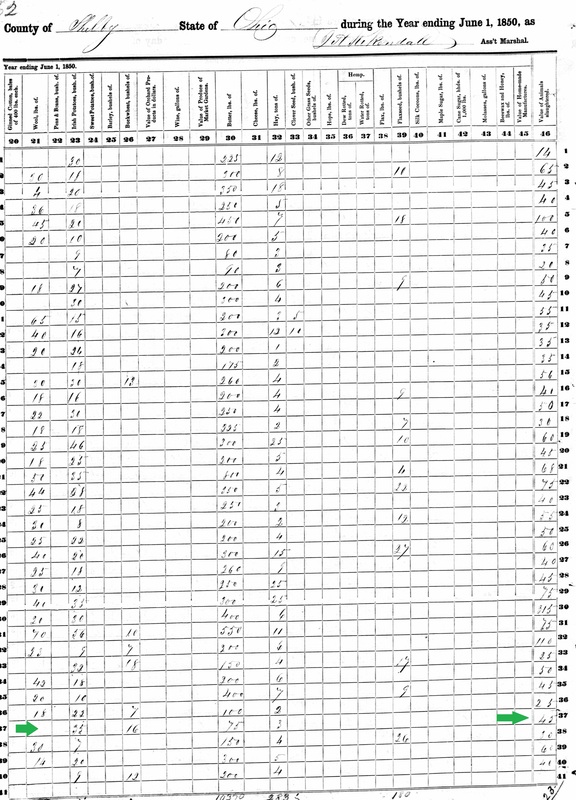 In the 1850 U.S. Census, they are living as farmers in Loramie Township (Shelby County), Ohio. Julius and Mary Rosa were married September 14, 1869 in Frenchtown (Darke Co.), Ohio. It was the second marriage for Julius, as his first wife, Christine Berge, died in 1868 when she was only 28 years old. Julius and Mary Rosa had seven children who lived into adulthood and many more grandchildren. It was quite common for French immigrants who settled in western Ohio to change the spellings and/or pronunciations of their surnames soon after arriving in America. Sometimes the change was intentional, but quite often it came about as a result of inaccurate transcriptions of the name on official documents, such as land deeds, marriage and birth records, or census schedules. Before I started researching my husband's family tree, I wasn't aware of the French immigrant influence in rural western Ohio. I had known about the settlement of the German immigrants in the Ohio Valley, probably because their influence was more widespread and they arrived in greater numbers than the French. Most of the churches and towns that were founded by French immigrants in western Ohio in the mid-1800s are still around, and even the influence of the language lives on in certain places. There is a town in Shelby County by the name of 'Russia;' however, it is pronounced "roo-shee," which is actually quite similar to the proper pronunciation of 'La Russie,' which means 'Russia' in French. (You can listen to the French pronunciation here.) Interestingly, though, another western Ohio French settlement by the name of 'Versailles' is actually pronounced 'ver-sales', so the original French pronunciation was lost/changed at some point.